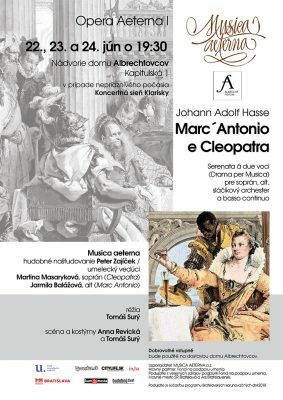 The intention of the project is to host three scenic opera performances (Serenata a due voci) performed by the ensemble Musica aeterna and its soloists in the courtyard of the Albrecht House in the Kapitulská Street No. 1, and in this way to invite the inhabitants of Bratislava and the tourists in a quite zone in the oldest part of the city. The aim is also to gain financial resources from the entrance fee as well as other eventual support for the completion of the revitalisation of the Albrecht House. The space of the house with commemorative value will offer living art – chamber music concerts, solo recitals, focus the attention on art scientific lectures, debates, discussions, which reflect the state of the art, of science, as well as wider ethical or social topics. Musica aeterna intends to organize chamber opera performances in the courtyard annually, in contextual or authentic interpretation on period instruments, whereby it aims to revive the cultural life of the city and to enrich the audience with an exceptional and new experience. The chamber opera as genre in early music offers numerous interesting titles, many of which originate with authors, who were active in Pressburg (Bratislava) or their pieces have been performed here in the past. 22nd June 2018, 23rd June 2018 and 24th June 2018 at 7 pm.